I stumbled across this recipe and immediately knew I had to make it. I love lasagna AND mini things. My even deeper love of Italian food started when my mom sent me a 10 or so page recipe book, filled with my great grandpa & great grandma Solari's recipes from Italy. One of my cousins had done us all the huge favor of translating one of their recipe books from Italian to English, typing it up to save electronically forever. It is full of fresh pasta, sweets, sauces and meaty fillings. Knowing I was going to have to feed two hungry boys, this recipe fit perfectly. I used my grandma's sauce recipe with most of the ingredients, although I would like to make it fully one day. I just didn't have the four hour window available to let it simmer on the stove! Chocked full of spices, garlic and hearty flavor, the sauce turned out so great! Once it was finished, it was time to start the minis. So simple, the ingredients included wonton wrappers (healthier than noodles), skim ricotta (even though I accidentally got whole milk...oh well!) with herbs, mozzarella, and the sauce. Easy. Just layer, bake until melted and enjoy! --Preheat oven to 375ºF. Heat a large skillet over medium heat. Add the ground beef , onions, salt, and pepper. Crumble the meat and saute the mixture for about 10 minutes, or until the ground beef is cooked through. Add the garlic and stir constantly for 30 seconds. 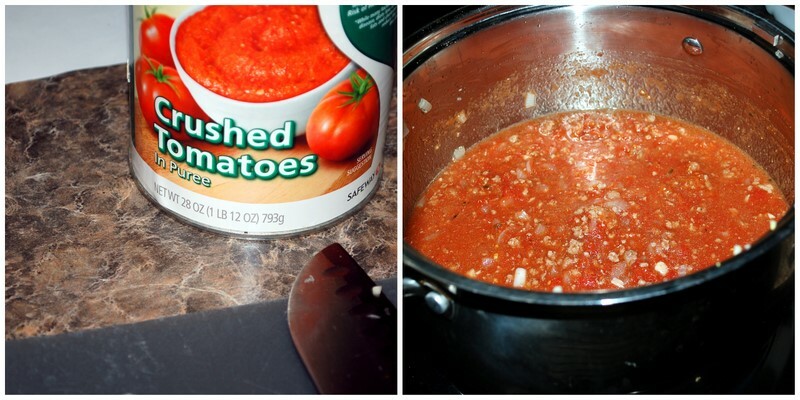 --Add the crushed tomatoes and 2 tsp of oregano. Bring the pan to a gentle boil. Reduce the heat to low and simmer for 10 minutes. Remove from heat and set aside. 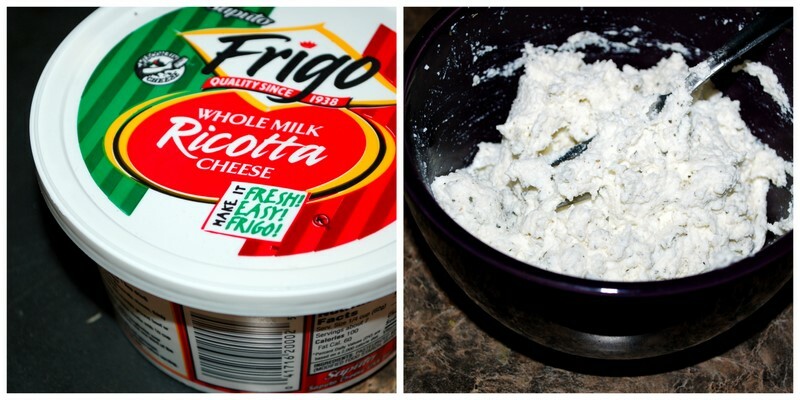 --In a large bowl, combine the ricotta, a pinch of salt and pepper, the remaining teaspoon of oregano, and the basil. Stir to mix well. Set aside. --Coat a 12-cup muffin tin with nonstick cooking spray. --Place 1 wonton wrapper into each of the 12 cups, pressing firmly in the bottom of the cup and up the sides. --Using half of the ricotta mixture, divide it among the 12 muffin cups. Next, using half of the turkey tomato sauce, spoon it evenly over each of the ricotta filled cups. Sprinkle with 2 tsp of mozzarella. --Gently press another wonton wrapper on top of the mozzarella layer. --Repeat the process by distributing the remaining ricotta, then the remaining tomato sauce, and finally the rest of the shredded mozzarella. --Bake for 10 minutes, or until the cheese has melted. --Let the cups cool, remove them from the pan, and serve! Sidenote: I had leftover sauce, since I nearly doubled the canned tomato sauce to accommodate my grandma's recipe. We used it to dip our garlic bread in...which was obviously a win. Lasagne is one of the best foods ever... and one of my hubby's favorite meals! I, like you, love all things MINI! I'm definitely going to have to make this, and soon! YUM! You're a much better food blogger than I am. You actually show the steps. That's probably because you're a much better cook than I am. Anyways, I'd make this, but I don't have any of those little cupcake holder things. Haha well thank you! For every 10 recipes, I remember to photograph one:) I don't think I could ever do it all the time! My tip is to look out for Bed, Bath & Beyond coupons in the newspaper/mail. You can get a cupcake pan pretty cheap!